A Cardiff-based radio show has been shortlisted for a prestigious Community Radio Award. OB’s Saturday Sport Show – broadcast on Radio Cardiff 98.7FM – is in contention to win ‘Sport Show of the Year’, in the UK-wide awards. The show – hosted by Chris O’Brien – has been on air since July 2016, and is broadcast every Saturday between 2pm and 3pm. It features an hour of sports opinion, interviews and more from in, around, and beyond Wales’ capital city. Over 350 entries from some 70 community radio stations were whittled down to form the 2017 Community Radio Awards shortlist. OB’s Saturday Sport Show is the only programme from Wales to be shortlisted. Winners of the awards will be announced at a ceremony on Saturday September 23, at The Station venue in Bristol. Chris O’Brien, presenter and producer of OB’s Saturday Sport Show, said: “I’m absolutely thrilled that the show is in contention to win Sport Show of the Year at the 2017 Community Radio Awards. It’s an absolute honour to be shortlisted. “The show aims to provide a parity of platform to a vast array of sporting events and activities – ranging from Cardiff’s thriving grassroots scene, to the city’s link with international events. “We passionately want to give a voice to under-represented teams, sporting disciplines and passions, from in and around our capital city. 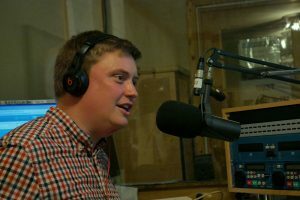 “Since hitting the airwaves, it’s been a pleasure to welcome dozens of guests on the show – ranging from major sports promoters, MonsterTruck stars and Welsh football internationals; to volunteers running community clubs, independent sports authors and niche sport participants – like unicycle hockey. “It’s such a privilege to be involved at Radio Cardiff – the only terrestrial station of any kind that broadcasts exclusively to Wales’ capital city. More than 100 volunteers make our station tick, providing a unique blend of programming. Previous editions of OB’s Saturday Sport Show can be found on Mixcloud. The programme also engages with listeners, and the local sports community, via Facebook and Twitter. It is one of the dozens of shows found on Radio Cardiff. The station broadcasts an array of diverse musical styles, local & national news and community interest programmes, every day – and is available on 98.7FM and online, including via its own dedicated app.